Principle #5 – Context. 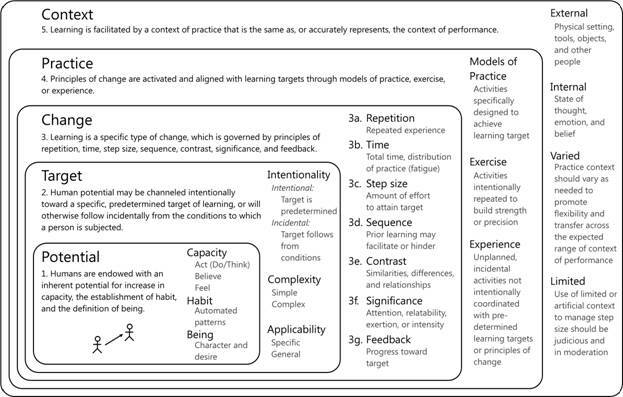 Learning is facilitated by a context of practice that is the same as, or accurately represents, the context of performance. The principle of context has been added to the model in Figure 7. A useful distinction is made in the framework between internal context and external context. Internal context is defined by one’s state of thought, emotion, and belief. External context is defined by the presence of other people, the physical setting, and any tools or objects present. Context for acts of thinking, believing, and feeling may stem from external sources, but may also manifest as the result of internal factors. For example, specific thoughts might induce certain feelings, and specific feelings might give rise to certain thoughts or beliefs. Context for acts of doing is largely external. Internal context is primarily induced through elements in the external context and sensory input received through interaction, however, internal context which is induced internally is also a factor in acts of doing, and accounts for phenomena such as chickening out or psyching oneself up to meet a formidable challenge. Although tools are a type of object, a distinction is highlighted here between objects which might be used in some way to perform an activity and objects which serve only an interpretive purpose in the activity—for example, a street skateboarder will ride the skateboard object, and slide down a stair rail. In this activity, these two objects constitute tools of use. Other objects in the scene along with their physical attributes—such as a trash can, rocks on the ground, a nearby picnic table, the sheen of the paint on the rail and whether or not the paint is chipped—are objects that provide an interpretive context for the skateboarder to estimate the height of the drop, the slipperiness of the rail, and the best launch and landing point. The term objects is used here to include both animate and inanimate objects.